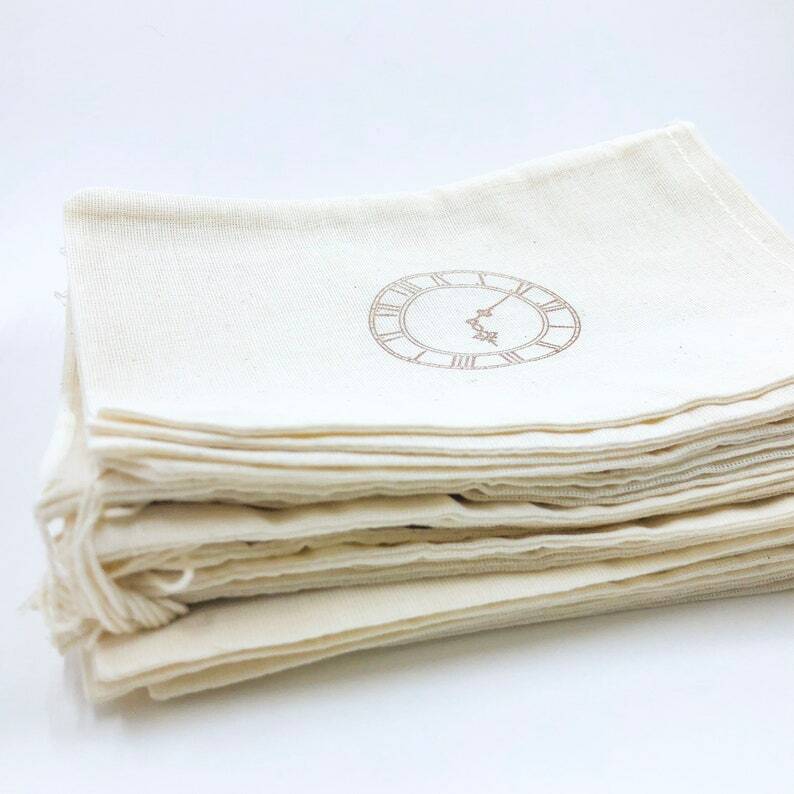 Set of 15 brown Vintage Clock favor bag. Perfect for any occasion, weddings, showers, or birthdays. Bags measure 6 X 8 inches. Exact measurements of each bag will vary slightly, bags are not gusseted. Each bag is hand stamped and ink color will vary slightly. Bags are a lightweight muslin 100% cotton fabric. Bags are made in the USA. Bulk pricing is not available, we offer our best prices to all customers. Check out the Sweet Thymes shop for more favor bags. Turnaround time is 3-5 business days (not including shipping time). If you need your order within 10 days of checking out please choose the priority mail option at checkout. If you need your items by a certain date please include a note in the checkout notes so we can make sure you receive your package with time to spare. First class mail takes 3-7 shipping days, priority mail is 2-3 shipping days, express mail is 1-2 shipping days. International Shipping: Duties, Customs, Taxes, VAT, and Fee charges for international packages are not included in the cost of shipping and will be charged to the buyer in the country of destination. Items (except international orders, custom orders and custom colors) can be returned within 7 days of receiving the item and must be received within 30 days of purchase. The item must be unused and still in the packaging. The item will be shipped back at the buyer’s expense and the refund will only be for the cost of the item. Please note shipping will not be refunded. ALL RETURNS WILL HAVE A 15% RESTOCKING FEE - this will be deducted from the return issued. Items that do not arrive on time: We ship all our items within 5 business days. Unfortunately, sometimes the postal systems do not arrive in the estimated time it projects. We are unable to control the speed of the post and are willing to refund the item if it is sent back but will NOT refund the shipping. Lost package: Please reach out to the shop within 7 days of estimated arrival time if a package has not arrived. Inquiries for lost packages made after 30 days of purchase will not be refunded or replaced. Lost international packages will not be replaced. Undeliverable packages: If a package comes back as undeliverable it can be re-shipped at the buyer’s expense or the buyer can request a refund less the original shipping costs. Bags arrived quickly and were perfect! Exactly as described. Will be perfect for our wedding welcome bags. Would buy again. Payment is expected before an item will be shipped. Please convo us for wholesale opportunities and promotional partnerships.